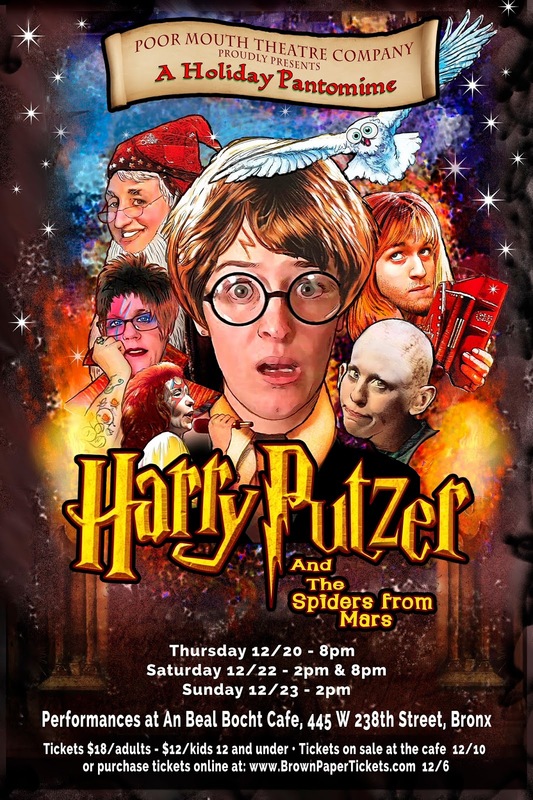 On December 20, 22, and 23, 2018, Poor Mouth presented its sixth annual holiday pantomime, HARRY PUTZER AND THE SPIDERS FROM MARS, written and directed by Scott Kennedy, with music direction by Kathryn Donnelly and songs by Scott Kennedy. Produced by Don Creedon and Scott Kennedy, the cast included Kathryn Donnelly, Suzanne Hockstein, Corinne Delaney, Aoife Williamson, Michelle Hendee and Aaron Souza. 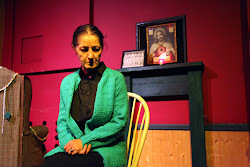 Set, props and costumes were designed by Suzanne Hockstein and sound was designed by Don Creedon. 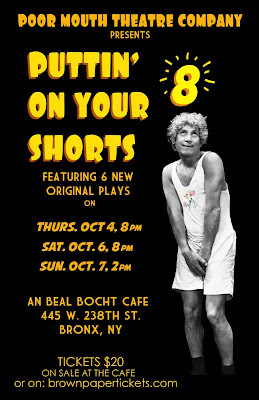 On October 4, 6 and 7, 2018, Poor Mouth Theatre Company presented PUTTIN' ON YOUR SHORTS 8, our eight annual festival of original short plays. 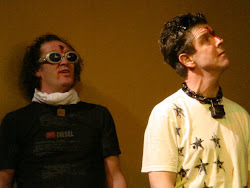 The festival, which was produced by Don Creedon with Costumes and Sets by Suzanne Hockstein, presented the following six plays: YEATS IN THE TOILET by Derek Murphy, featuring Michael Mellamphy and Sarah Street, THE LARGE JAR by Kate Gill, featuring Katherine O'Sullivan, A DOLL'S MOUSE by Ron Young, featuring Stephen Ryan and Katie Politis, BOWERY BIRDS written by Michael Fitzpatrick, featuring Siobhan McBride, Grainne Duddy, and John Duddy. 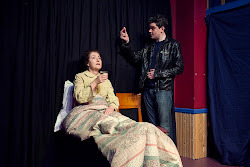 THE KING OF GALWAY by Seamus Scanlan, featuring Peter Cormican and Seamus O'Farrell, and FOR BETTER OR WORSE written by Brona Crehan, featuring Jo Kinsella. 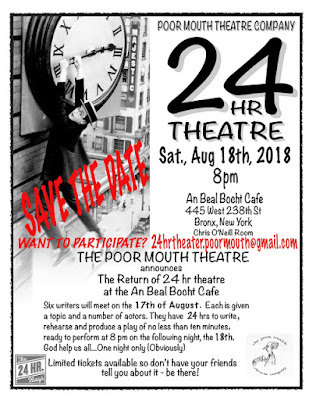 On Saturday, August 18, 2018, Poor Mouth presented its annual 24 HOUR THEATRE FESTIVAL. Seven writers met on Friday at 9:00 pm. Each was given a topic and a selection of actors. 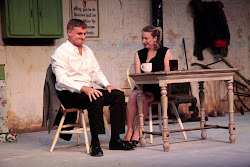 They then had 24 hours to write, direct, rehearse and perform a ten minute play, the following night. What a night! 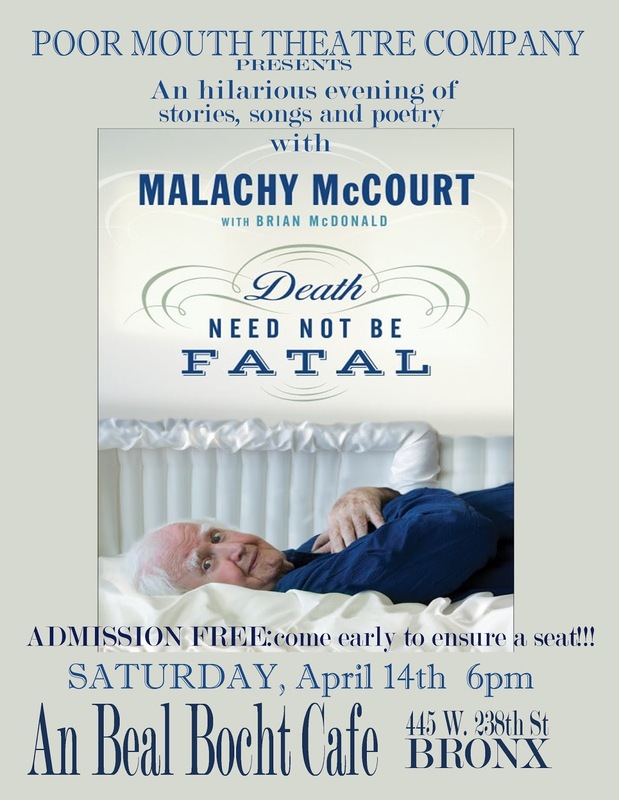 On April 14, 2018, Poor Mouth presented the wonderful Malachy McCourt in his hilarious evening of stories, songs and poetry DEATH NEED NOT BE FATAL. 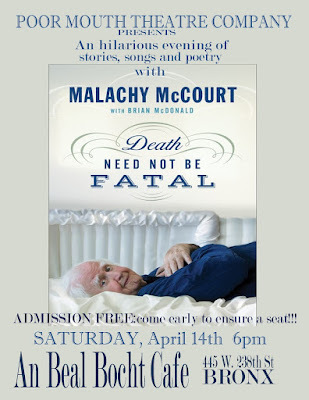 In this beautiful performance, Malachy trains a sober eye on the tragedies that have shaped his life, the deep losses of losing his brothers, but ultimately how to live life to the fullest and grow old without regret. 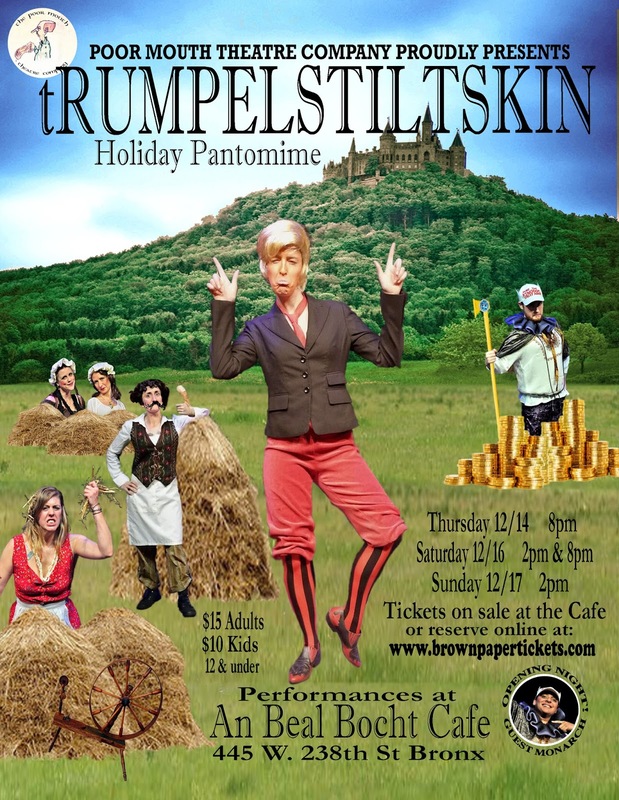 On December 19, 21 and 22, 2017, Poor Mouth presented its fifth annual holiday pantomime, tRUMPELSTILTSKIN, written and directed by Scott Kennedy, with music direction by Kathryn Donnelly and songs by Suzanne Hockstein, Kathryn Donnelly, Scott Kennedy and Corinne Delaney. 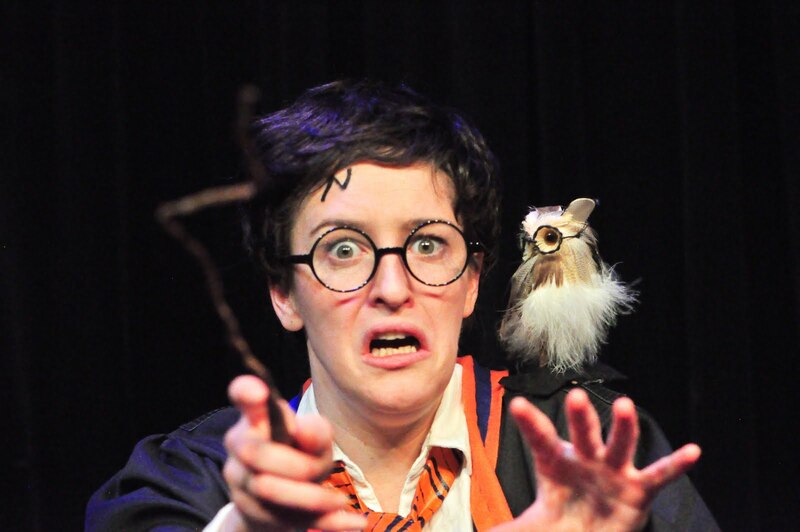 Produced by Don Creedon and Scott Kennedy, the cast included Kathryn Donnelly, Suzanne Hockstein, Corinne Delaney, Aoife Williamson, Michelle Hendee, Caitlin Seward, and Aaron Souza. 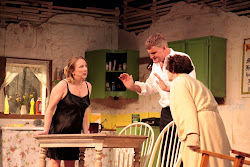 Set, props and costumes were designed by Suzanne Hockstein and sound was designed by Don Creedon. 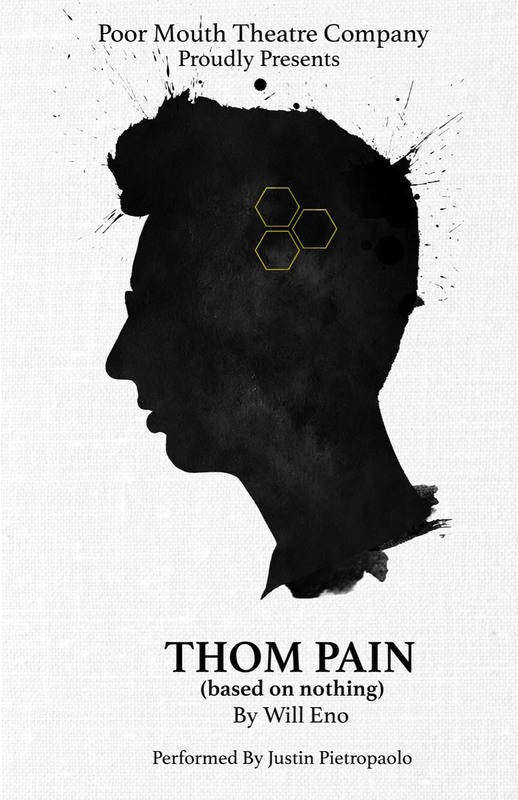 On Oct 19, 21 and 22, 2017, Poor Mouth Theatre Company presented THOM PAIN (Based on Nothing) by Will Eno, starring Justin Pietropaolo. 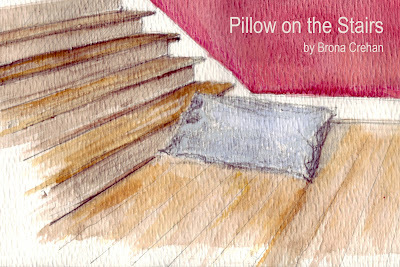 This one-man play was a finalist for the 2005 Pulitzer Prize for Drama. 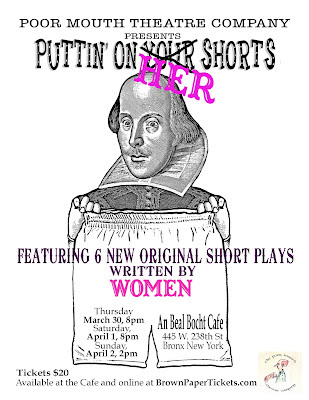 On March 30, April 1 and 2, 2017, Poor Mouth Theatre Company presented PUTTIN' ON HER SHORTS, a festival of new original short plays, all written by women (for which they received an IrishCentral.com 2017 Creativity & Arts Award Nomination). The festival, which was produced by Don Creedon, presented the following six plays: AND IN MY HEART by Honor Molloy, featuring Gina Costigan, LOOKING FOR OPHELIA by Olivia Reevell, featuring Aoife Williamson, Andrew Carr and Gabrielle Adkins, THE RIGHT THING by Brona Crehan, featuring Jo Kinsella and Billy Carter, ROCKY AND ME AT MAPLE GROVE, written and performed by Maeve Price, WAKEFIELD by Amy E. Witting, featuring Aoife Williamson and Andrew Carr, and UNRAVEL, written and performed by Allison Sylvia. 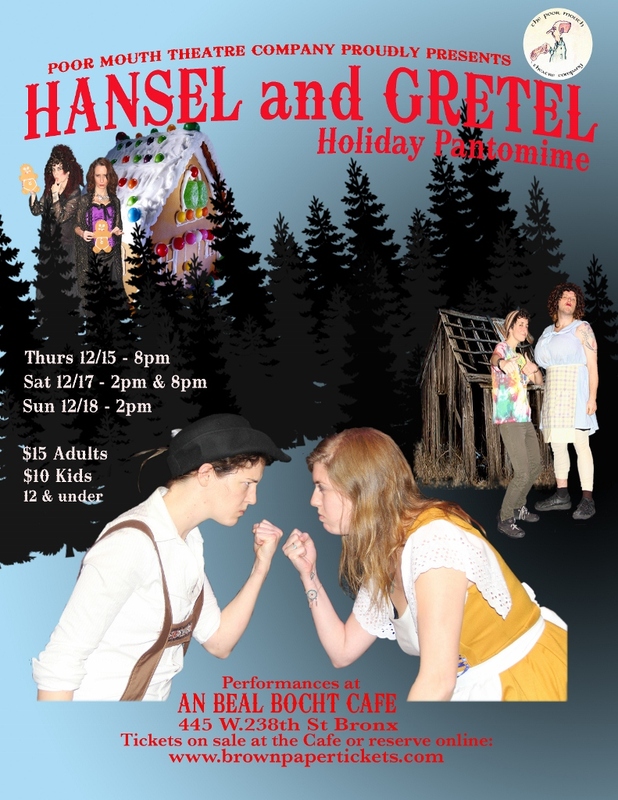 Poor Mouth Theatre Company presented HANSEL & GRETEL, its fourth annual holiday pantomime, on Dec 15, 17 and 18, 2016. Written and directed by Scott Kennedy, with music direction by Suzanne Hockstein, and songs by Kathryn Donnelly and Suzanne Hockstein, the show featured Corinne Delaney, Aoife Williamson, Michelle Hendee, Danny Flinn, Suzanne Hockstein and Kathryn Donnelly. On June 25, 2016, Poor Mouth Theatre Company presented THE PARTING GLASS. 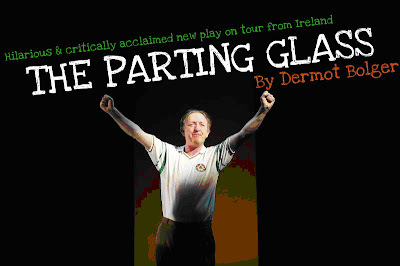 Straight from a national tour of Ireland, Dermot Bolger's highly acclaimed new play starred Abbey Theatre veteran Ray Yeats as a returning Irish expat who bears witness to his country's stunning reversal of fortune. 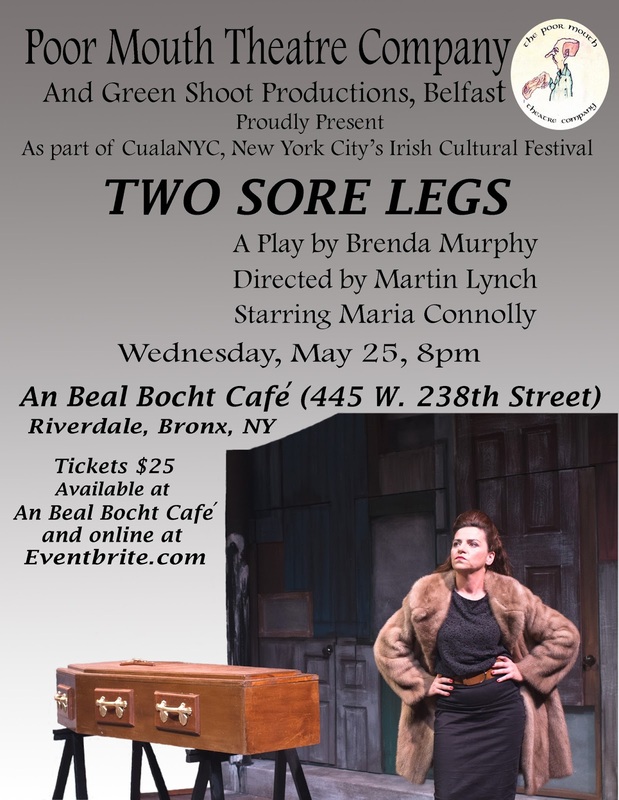 On May 25, 2016, Poor Mouth Theatre Company presented TWO SORE LEGS (Direct from Ireland! 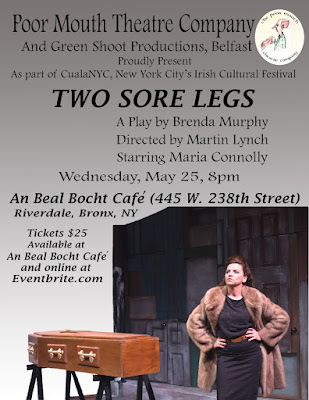 ), A new play by Brenda Murphy, directed by Martin Lynch and starring Maria Connolly, as part of CualaNYC, New York City's Irish Cultural Festival. On May 21, 2016, Poor Mouth Theatre Company presented ALICE MILLIGAN, A GIRL OF GENIUS (Direct from Ireland! 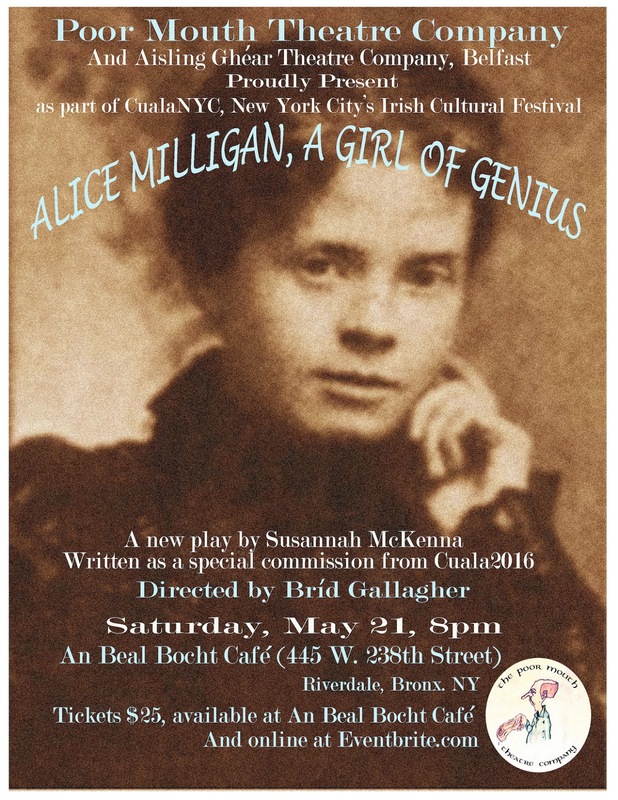 ), A new play by Suzannah McKenna, directed by Brid Gallagher and featuring Diona Doherty, as part of CualaNYC, New York City's Irish Cultural Festival. 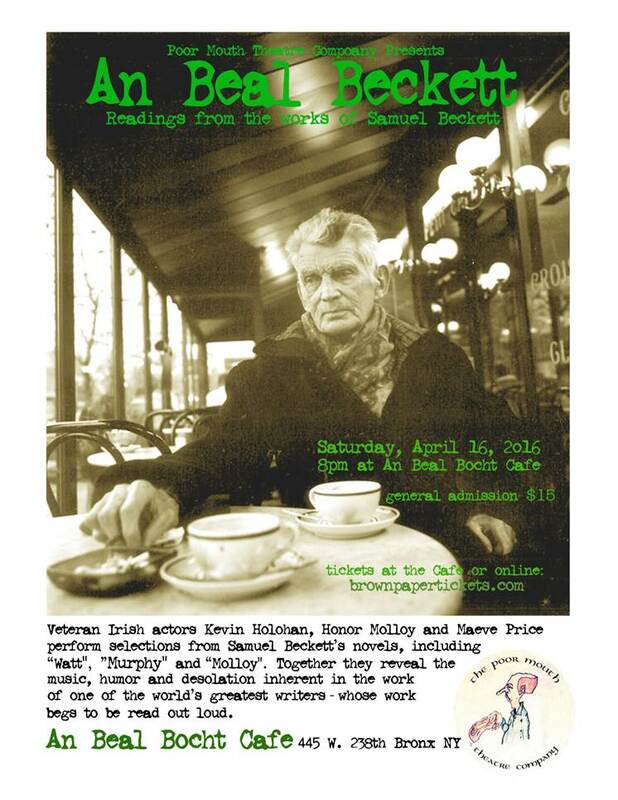 On April 16, 2016, Poor Mouth Theatre Company presented AN BEAL BECKETT, readings from the works of Samuel Beckett, featuring veteran Irish actors Kevin Holohan, Honor Molloy and Maeve Price. Together, they revealed the music, humor and desolation inherent in the work of one of the World’s greatest writers—whose work begs to be read out loud. 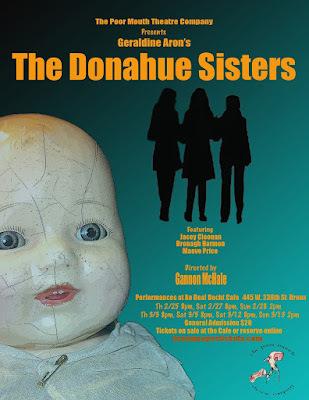 The attic of the family home in Ireland, once a playroom, was the setting for THE DONAHUE SISTERS, a funny but dark play from Geraldine Aron, author of GALWAY GIRL. 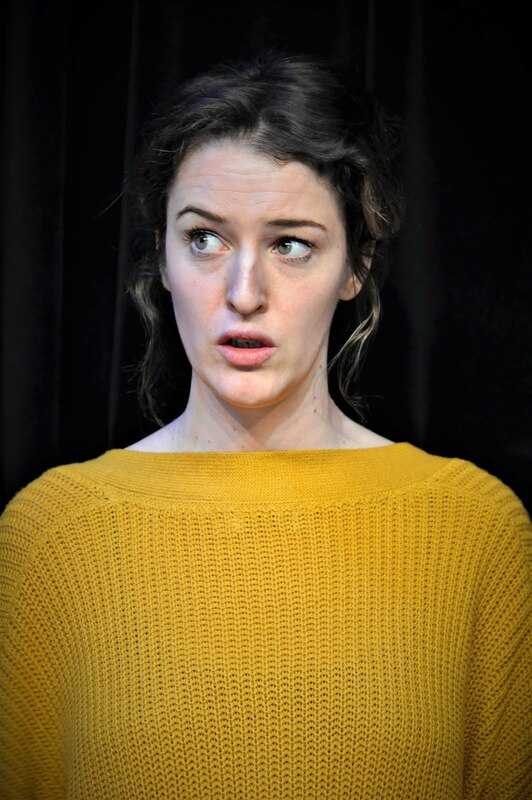 Featuring Jacey Cloonan, Bronagh Harmon and Maeve Price; and directed by Gannon McHale; Poor Mouth presented this play at An Beal Bocht Cafe in late February/early March 2016. 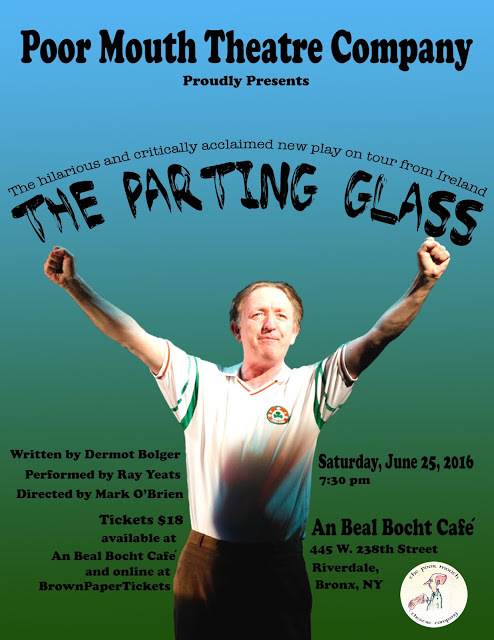 The production was produced by Dermot Burke and Kathryn Donnelly with set design and costumes by Suzanne Hockstein. 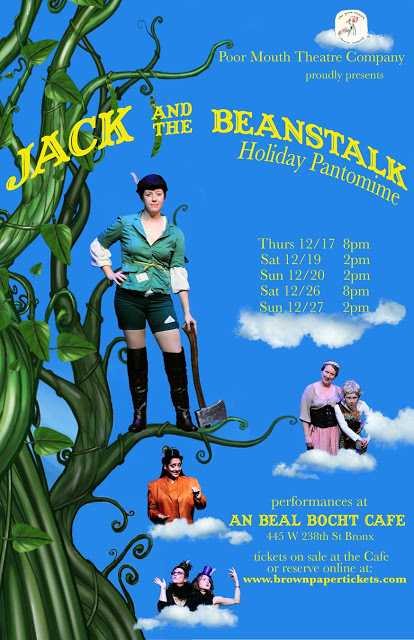 From December 17 to 27, 2015, Poor Mouth Theatre Company presented it's third Annual Holiday Pantomime JACK AND THE BEANSTALK. 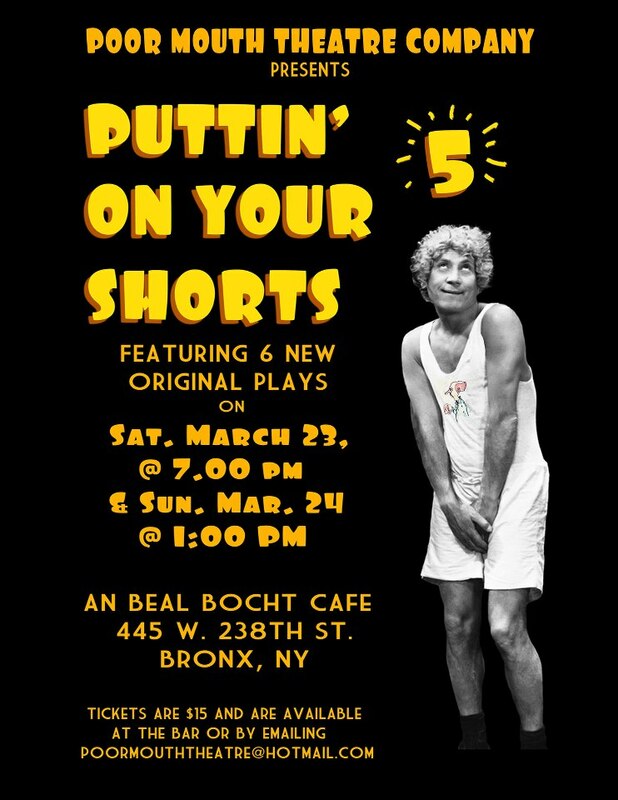 Written and Directed by Scott Kennedy and featuring Music Direction/Composition by Suzanne Hockstein, the cast featured Corinne Delaney, Leila Duffy, Bronagh Harmon, Suzanne Hockstein, Kathryn Donnelly, Caitlin Seward, Stephen Smallhorne, and Danny Flinn. 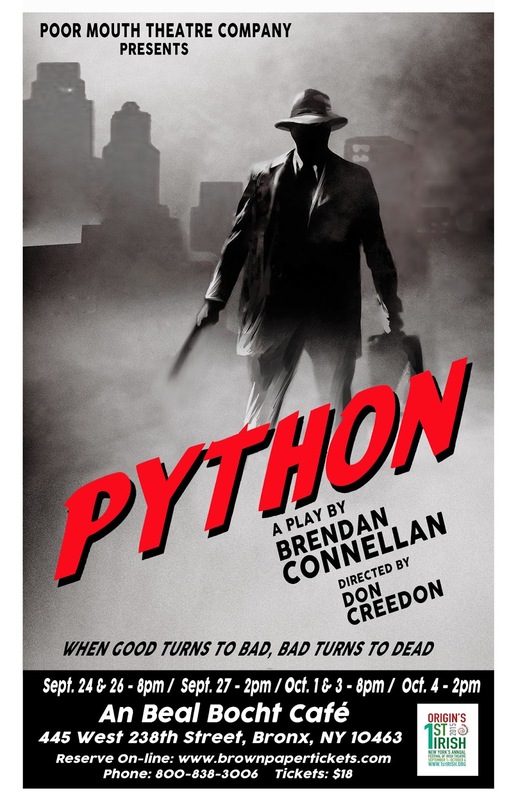 From Sept 24 to Oct 11, 2015, Poor Mouth Theatre Company presented the world premiere of Brendan Connellan's dark comedy thriller PYTHON. Produced by Dermot Burke and Kathryn Donnelly, directed by Don Creedon, and featuring Paul Nugent, Mark Byrne, David O'Hara, Conor McManus and Laurence Lowry; "Python" appeared as part of the 2015 1st Irish Theatre Festival, the only theater festival in the world dedicated to Irish playwrights. On May 7, 9, 14 and 16, 2015, Poor Mouth Theatre Company presented Neil Simon's classic comedy BAREFOOT IN THE PARK, produced by Scott Kennedy and directed by Taylor Rich, featuring Elissa Goonan, Joe Bettles, JC Sullivan and Don Melvin. 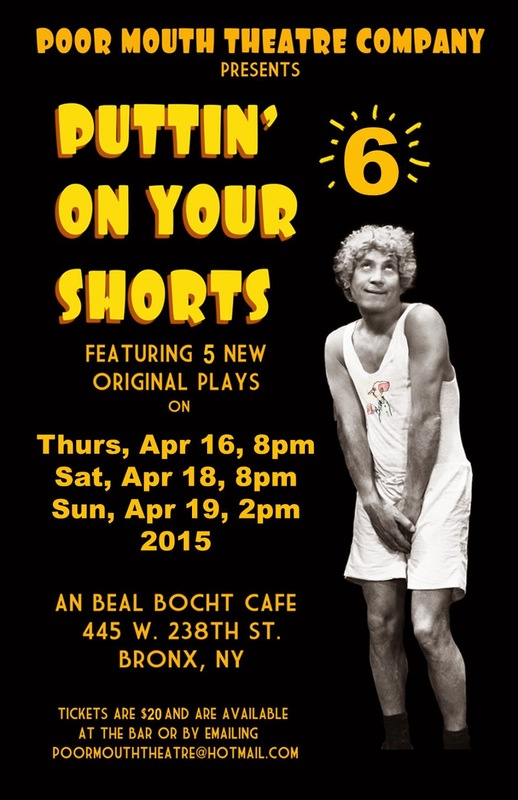 On April 16, 18 and 19, 2015, Poor Mouth Theatre Company celebrated its Fifth Anniversary with its sixth production of PUTTIN' ON YOUR SHORTS 6, with the following five plays: WHO GOT THE GIRL written and directed by Janice Young, featuring Brendan Goggins, Jordan Laks, and Aaron Souza; THE BLOOD FLOW THING written by Seamus Scanlan, directed by Don Creedon, featuring Mark Byrne and Maria Deasy; MOONLIGHT SONATA written and directed by Brona Crehan, featuring Grainne Duddy, THE DISREPUTABLE written and directed by Ron Young, featuring Kathryn Donnelly, Robert Fitzgerald, and Pat Hegarty; DIVINE INTERVENTION written and directed by Don Creedon, featuring Maeve Price and Don Creedon. 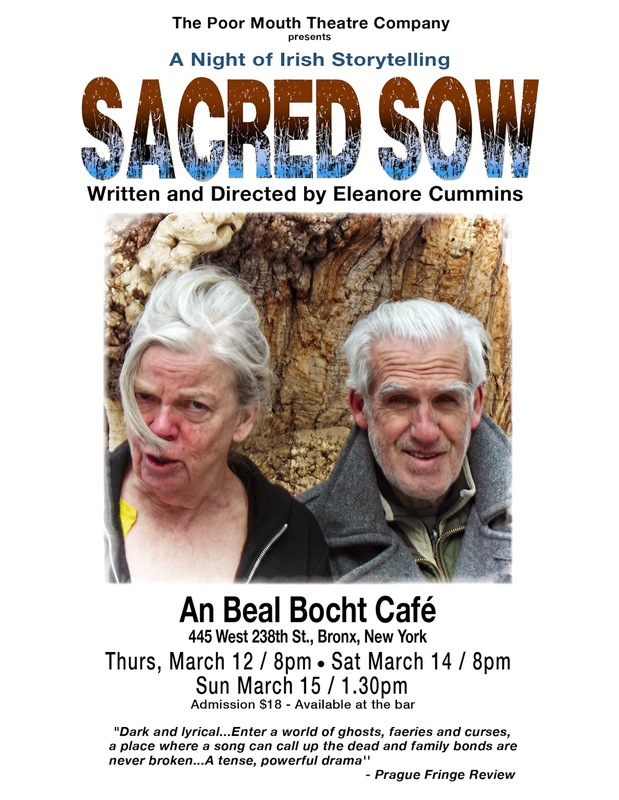 On March 12, 14 and 15, 2015, Poor Mouth Theatre Company presented SACRED SOW written and directed by Eleanor Cummins at An Beal Bocht Cafe, and also at Ryan's Daughter in Manhattan on Mar 19, 21 and 22. 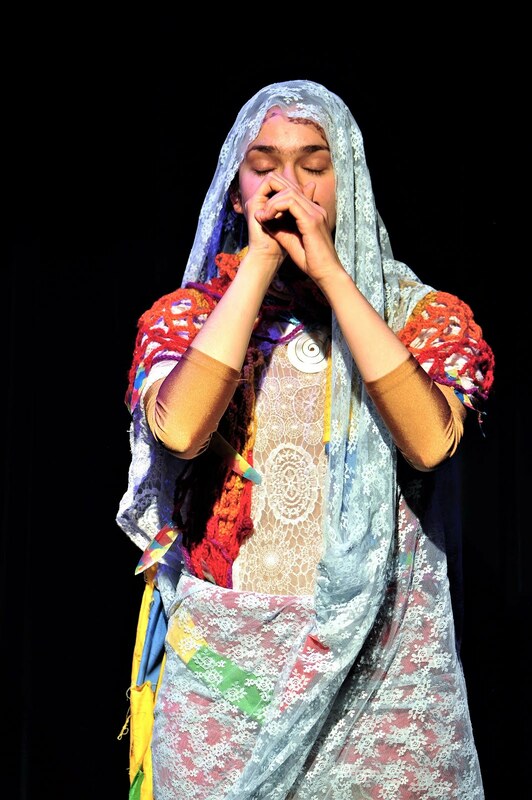 An additional performance was also presented at Arlene's Grocery in the lower east side on March 20. 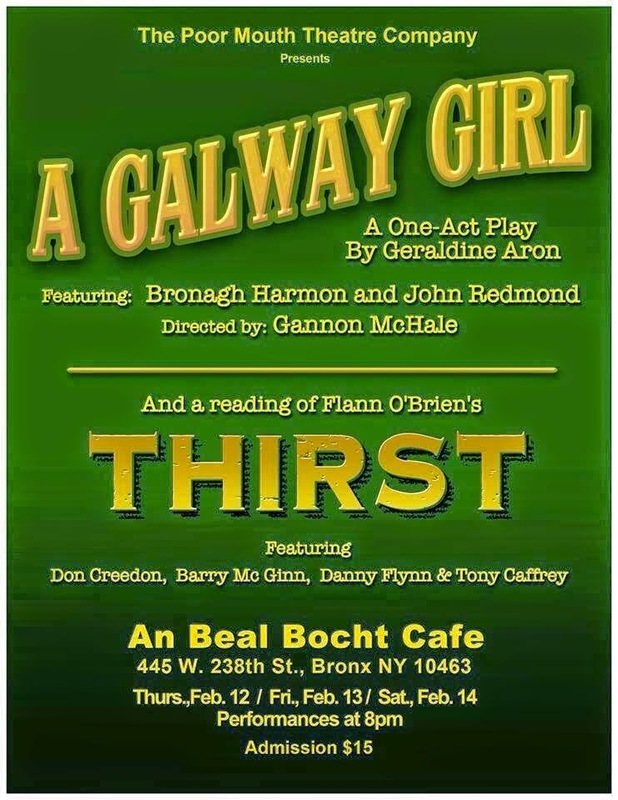 On Feb 12, 13 and 14, 2015, Poor Mouth Theatre Company presented A GALWAY GIRL by Geraldine Aron, featuring Bronagh Harmon and John Redmond, directed by Gannon McHale. Included in the program was a reading of THIRST by Flann O'Brien, featuring Don Creedon, Barry McGinn, Danny Flynn and Tony Caffrey. Rounding off the evening was the short film LIL' DIVIL by Stephen Smallhorne and Eric Bronco, featuring Bronagh Harmon, Andy Fitzpatrick, and Tony Caffrey. This program was produced by Dermot Burke. 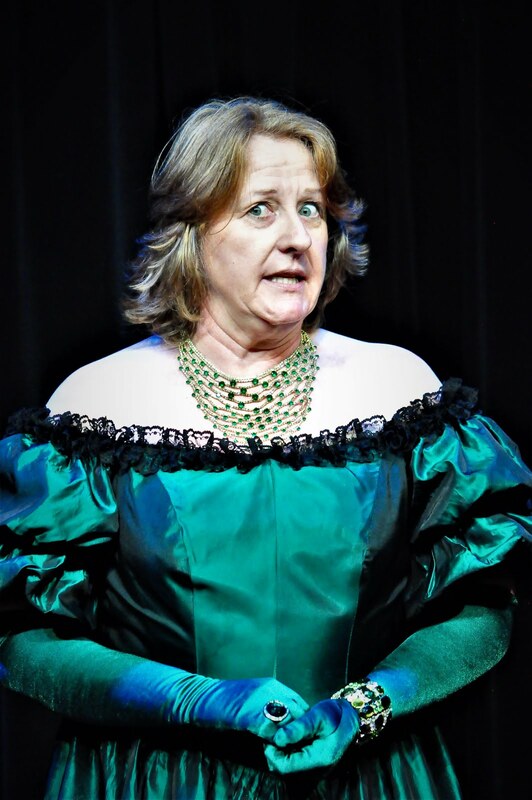 On March 15, 2015, we presented A GALWAY GIRL once again for a gala benefit performance in aid of the Irish volunteers for the homeless at the Aisling Irish Community Center in Yonkers. 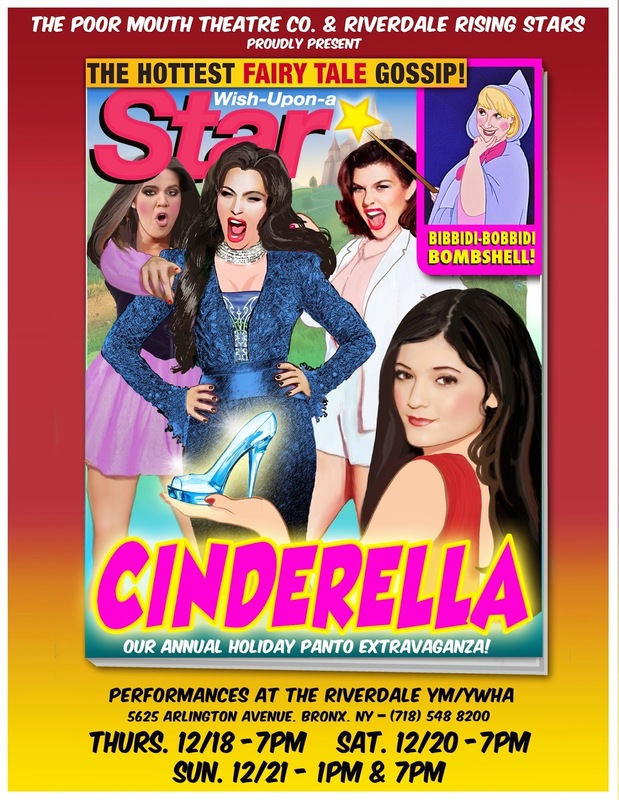 On December 18, 20 and 21, 2014, Poor Mouth Theatre Company and Riverdale Rising Stars presented their second annual Holiday pantomime CINDERELLA at the Riverdale YM/YWHA. 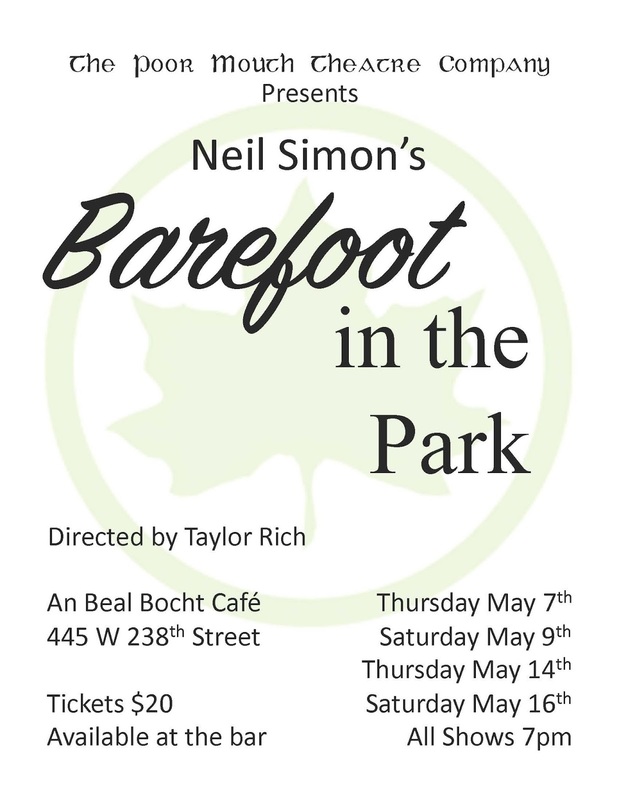 Produced by Scott Kennedy and directed by Julian Gamble, the cast featured Taylor Rich, Caitlin Seward, Stephen Smallhorne, Pat Gilheany, and Bronagh Harmon. 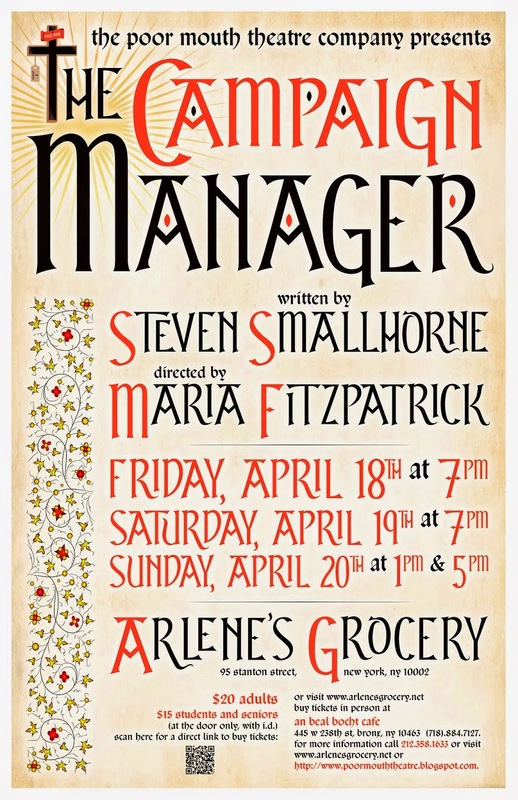 On April 18, 19 and 20, 2014, Poor Mouth Theatre Company brought Steven Smallhorne's hilarious satire THE CAMPAIGN MANAGER to Arlene's Grocery on New York's Lower East Side. 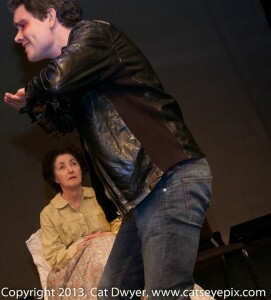 Produced by Dermot Burke and directed by Maria Fitzpatrick, the cast featured Conor McManus, Bronagh Harmon, and Andy Fitzpatrick. 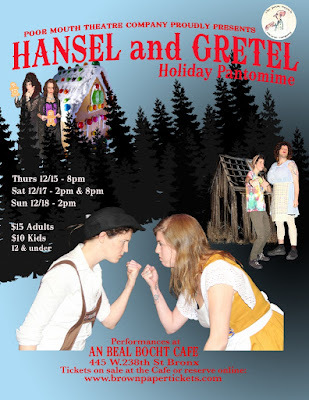 On Dec 19, 21 and 22, 2013, Poor Mouth Theatre Company and Riverdale Rising Starts presented the Bronx's first ever all-new original traditional pantomime SNOW WHITE AND THE SEVEN DWARFS at the Riverdale YM/YWHA. 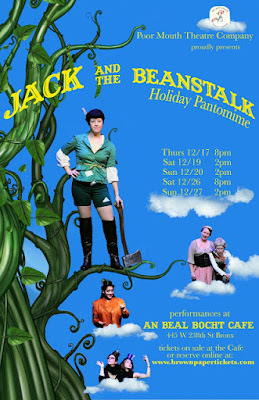 Holiday fun for all the family, this show was a wonderful success, which we hope will now become an annual event! 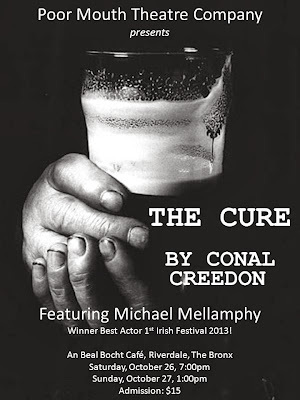 On Oct 26 and 27, 2013, Poor Mouth Theatre Company presented THE CURE by Conal Creedon, featuring Michael Mellamphy (winner Best Actor 1st Irish Festival 2013) and directed by Tim Ruddy. 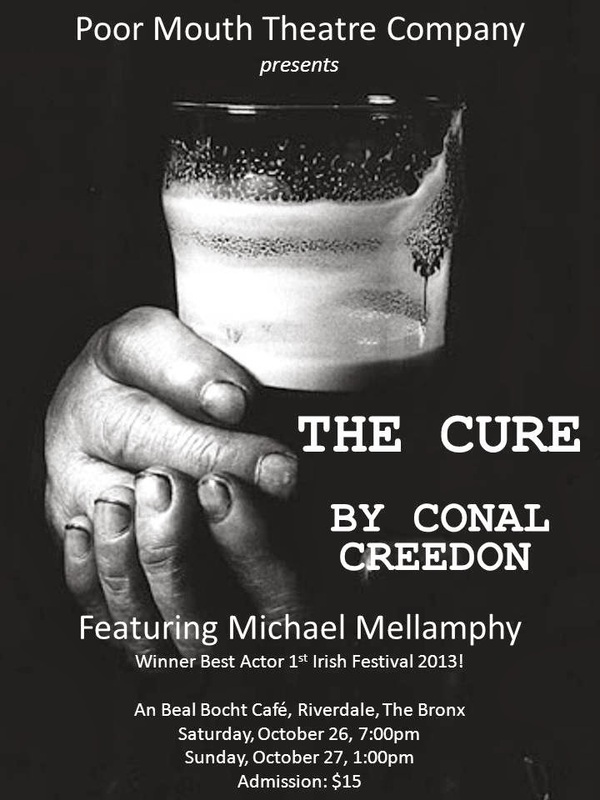 The Cure is set at the height of Ireland's boomtime, "The Celtic Tiger". 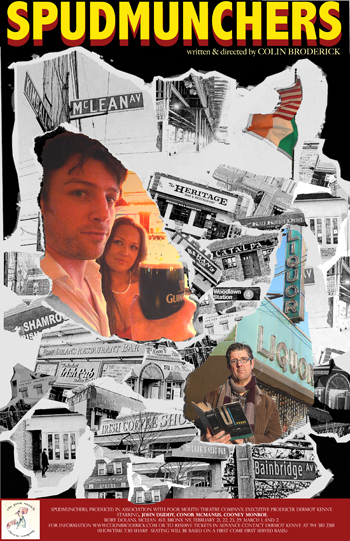 It takes us on a hilarious and heart-rending early-morning journey through the streets of Cork City, as our narrator waits anxiously for the pubs to open. 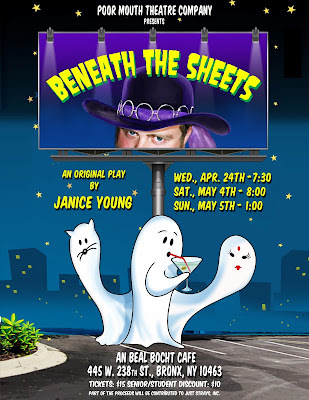 On April 24, May 4 & 5, 2013, Poor Mouth Theatre Company presented BENEATH THE SHEETS, a hilarious new comedy by Janice Young, featuring Pat Harper, Jordan Laks, Keith McDermott, Marissa Penta Caitlin Seward and Janice Young. 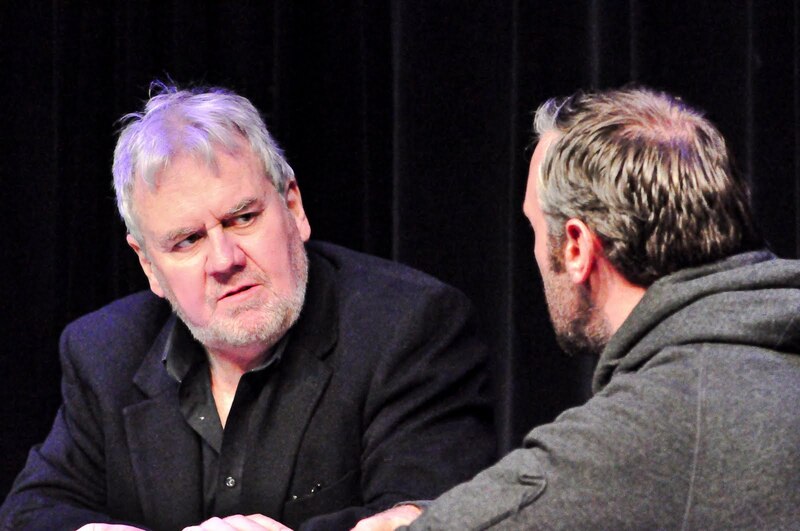 Partial proceeds from the show went to Just Strays, Inc.
On April 25, 2013, Poor Mouth Theatre Company continued its mission to bring theatre to all corners of the Bronx by presenting BOYS SWAM BEFORE ME by Seamus Scanlan, as part of Artists Without Walls' multicultural event at Lehman College, featuring Katherine O'Sullivan and Paul Nugent, and directed by Don Creedon. Poor Mouth would like to thank Charles R. Hale of Artists Without Walls for inviting us to participate in this wonderful event. On March 23 & 24, 2013, Poor Mouth presented PUTTIN' ON YOUR SHORTS 5, another great night of all-new original short plays, with the following lineup: CAMPAIGN STRATEGY - written and directed by Stephen Smallhorne, featuring Ben Becher and Conor McManus; APERTURE - written and directed by Kevin Smyth, featuring Dan Stern and Hal Smyth; KILL THE BID - written and directed by Brendan Kennellan, featuring Brendan Connellan and Mat Shapiro; A MEAN EYE - written and performed by Louise Graham, directed by Don Creedon; BOYS SWAM BEFORE ME - written by Seamus Scanlan and directed by Don Creedon, featuring Katherine O'Sullivan and Paul Nugent; SONG FOR MIRANDA LAMBERT written, directed and performed by Pam Tate and Robin Rich. On January 19 & 20, 2013, Poor Mouth presented Brona Crehan's new play PILLOW ON THE STAIRS, directed by Don Creedon and featuring Brona Crehan, Johnnie McConnell and Jacqueline Kealy. 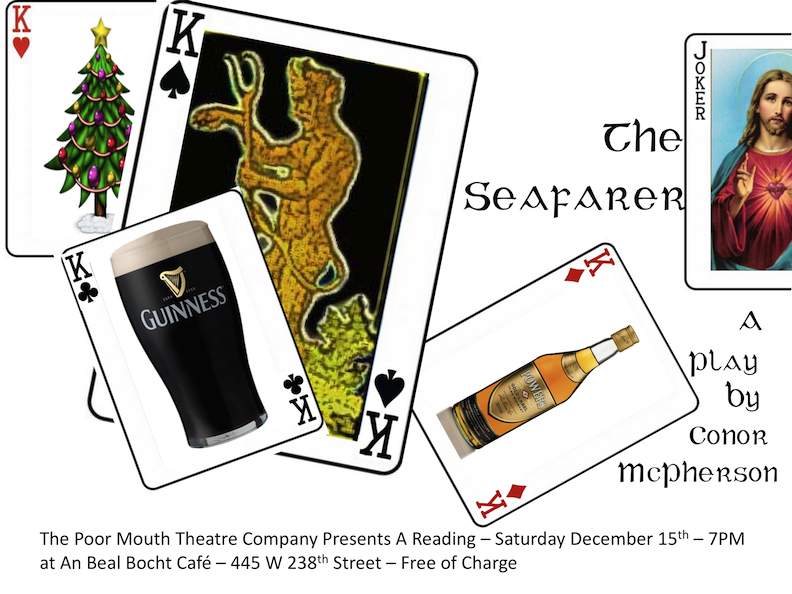 On December 15, 2012, Poor Mouth presented a staged reading of Conor McPhearson's classic holiday play THE SEAFARER, directed by Scott Kennedy and featuring Joan Lunoe, Don Creedon, Larry Lowry, Conor McManus, David O'Hara and Julian Gamble. 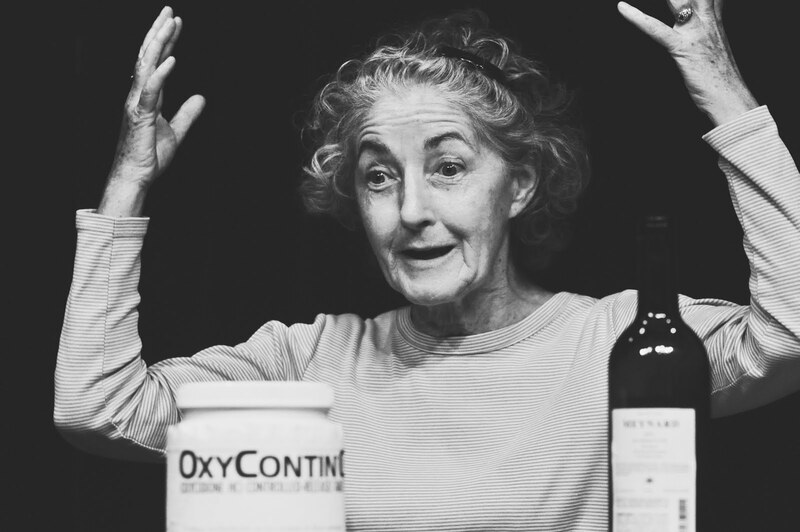 On July 25 and 26, 2012, Poor Mouth presented GET A ROOM!, the acclaimed new play from Anto Nolan, featuring Nicola Murphy. 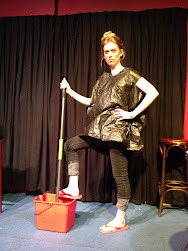 En route to the 2012 Dublin Theatre Festival (Sept/Oct 2012), Get a Room is part of a four part series of one-act plays written by Anto, which includes Dirty Money, The Handler and A Lady is Waiting. 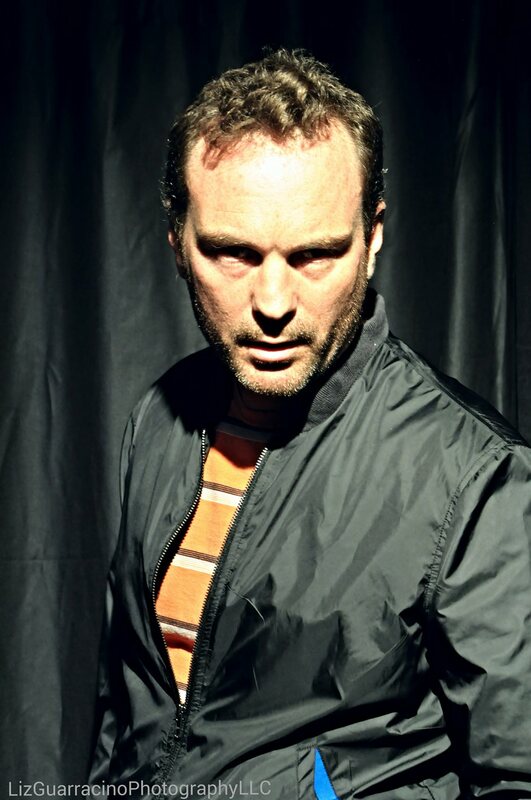 Watch out for further installments of this series from one of Dublin's great actor/director/playwrights. 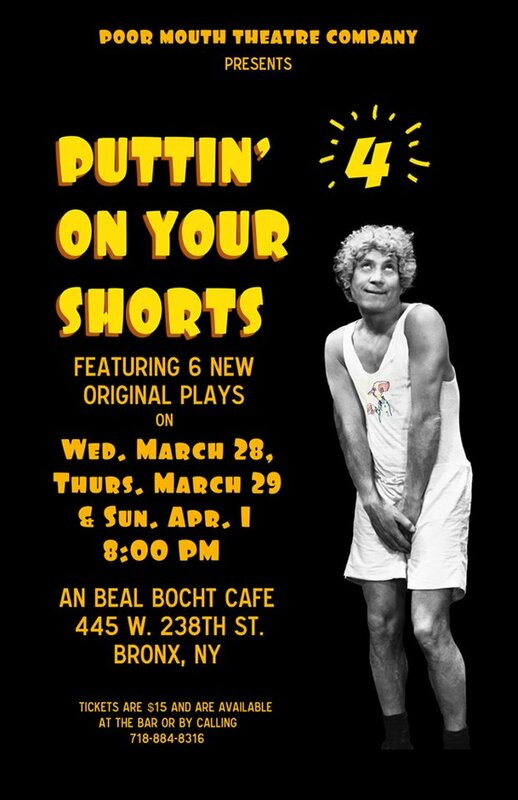 On March 28, 29, and 31, 2012, Poor Mouth presented PUTTIN' ON YOUR SHORTS 4, another great night of all-new original short plays, with the following lineup: EDDIE - written and directed by Nancy Finn, featuring Joan Lunoe; HELP WANTED - written and directed by Pam Tate, featuring Pamela Trantham, Kevin Higgins, and Jess Heron; SHE JUST LEFT - written and directed by Janice Young, featuring Jordan Laks, Peter Mountford, and Caitlin Seward; COMFORT AND JOY - written by Brona Crehan, directed by Don Creedon, featuring Lawrence Lowry; OUTTAKES - written and directed by Stephen Smallhorne, featuring Stephen Smallhorne, Bronagh Harmon, and Tony Caffrey. 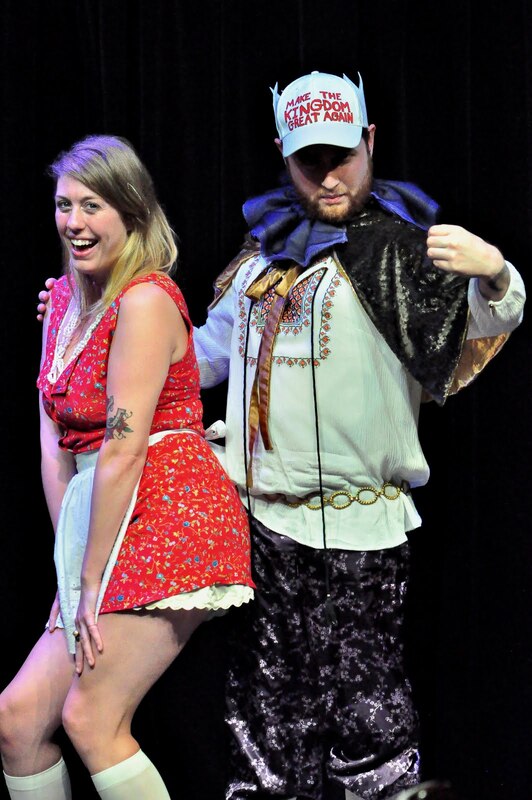 On Saturday, February 26, 2012, Poor Mouth presented its second annual 24 HOUR THEATRE FESTIVAL. 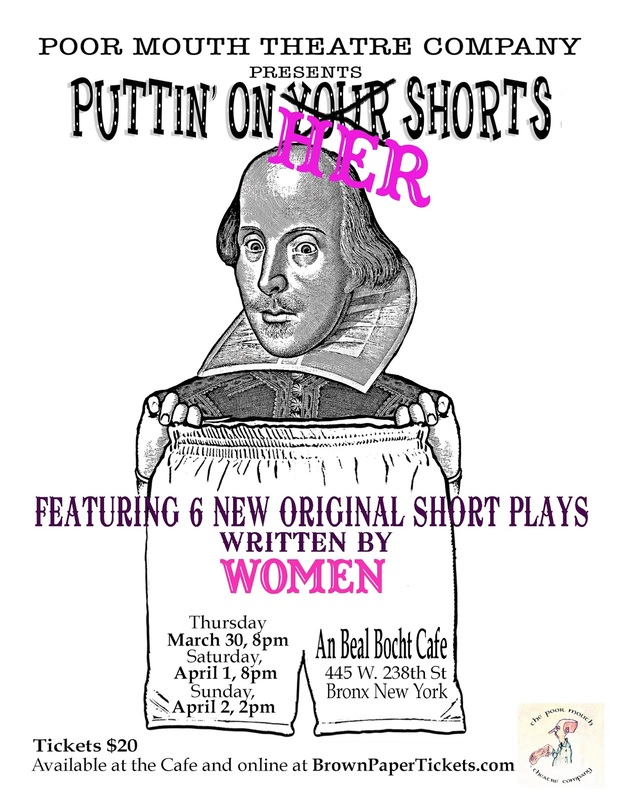 Six writers met on Friday, February 25, at 9:00 pm. Each was given a topic and a selection of actors. 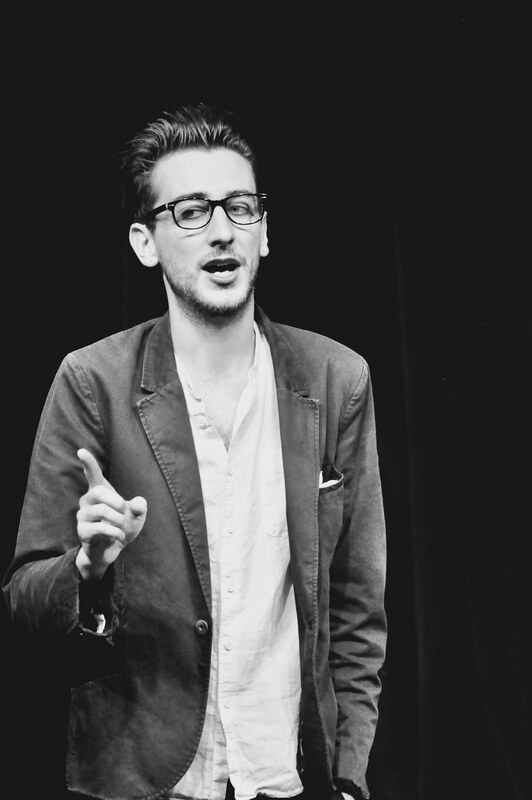 They then had 24 hours to write, direct, rehearse and perform a ten minute play, the following night. Continuing our mission to bring theater to unlikely locations, in February 2012, Poor Mouth presented the world premier of SPUDMUNCHERS in Rory Dolan's bar on McLean Avenue in the Bronx. 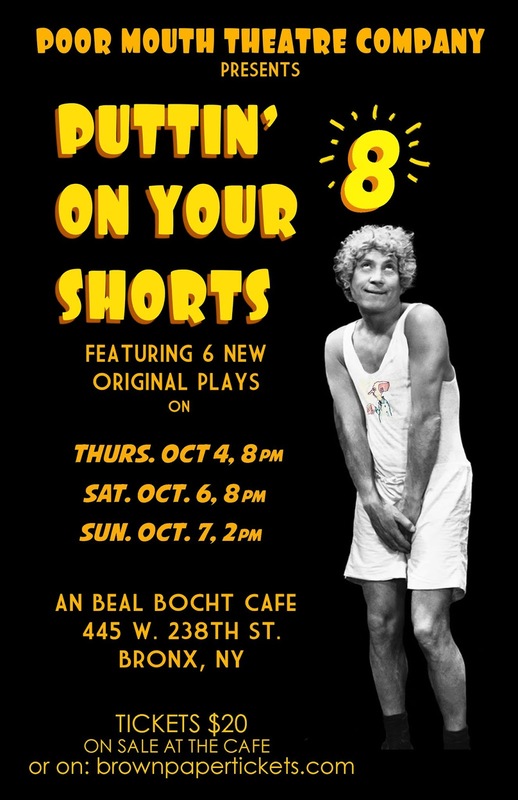 Written and directed by Colin Broderick, renowned author and Poor Mouth founding member, Spudmunchers is the story of two Irish brothers, living together in a one-bedroom apartment in the Irish enclave of Woodlawn, the Bronx. 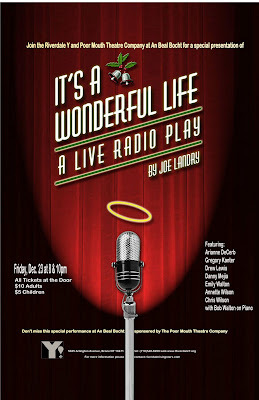 Poor Mouth Theatre Company was delighted to welcome The Riverdale Y's production of IT'S A WONDERFUL LIFE, the perfect holiday show, on Friday, December 23, 2011. 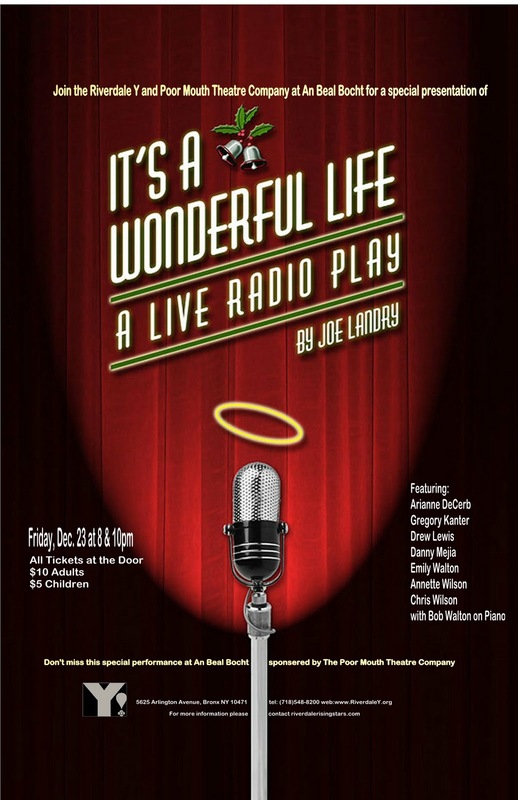 Seven actors brought George Bailey, Mary, the angel Clarence and the townspeople of Bedford Falls to life, playing dozens of characters and performing all the sound effects, just as they did during the golden age of radio. Featuring Arianne DeCerb, Gregory Kanter, Drew Lewis, Danny Mejia, Emily Walton, Annette Wilson, Chris Wilson, with Bob Walton on piano! 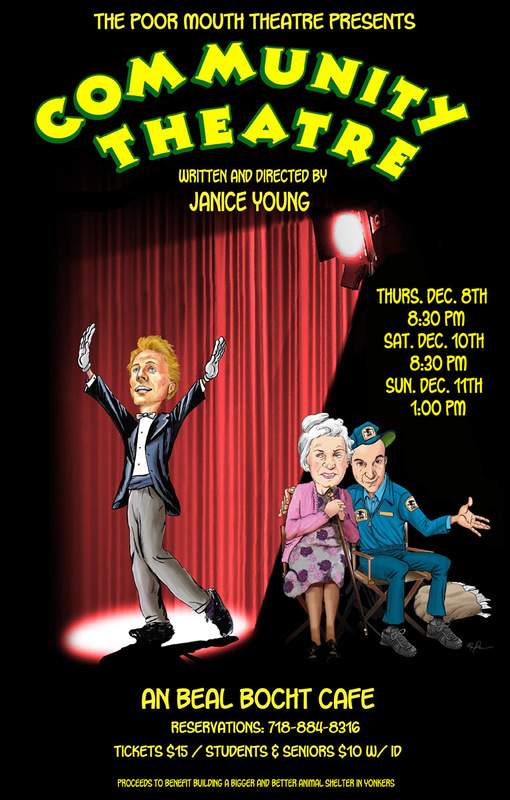 On December 8, 10 and 11, 2011, Poor Mouth presented COMMUNITY THEATRE, an all-new, original comedy by Riverdale native, Janice Young. 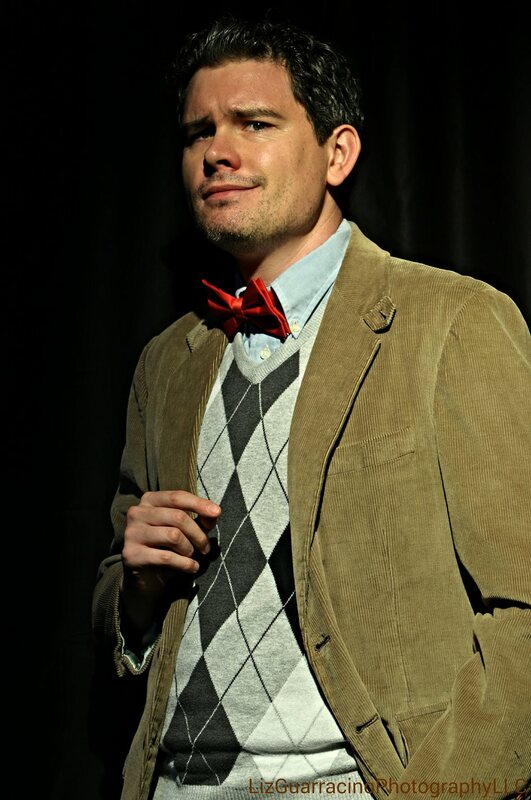 Community Theatre is the story of Jack Applegate, amateur theatre director extraordinaire! 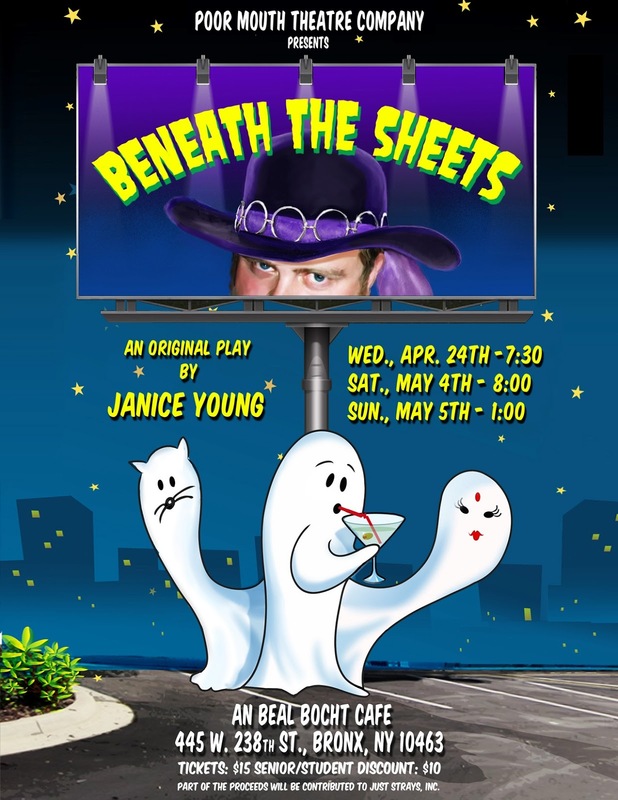 There is a fine line between dream and delusion and Jack has been straddling it for twenty years, much to the dismay of his long-suffering mother, Gladys. 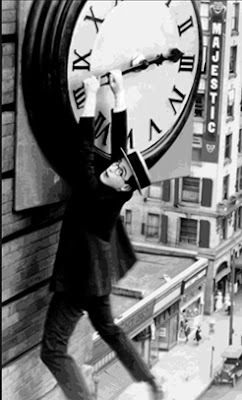 Will Jack finally listen to his mother and settle down to a 9-5 lifestyle or will his latest theatrical venture drive them both over the edge? 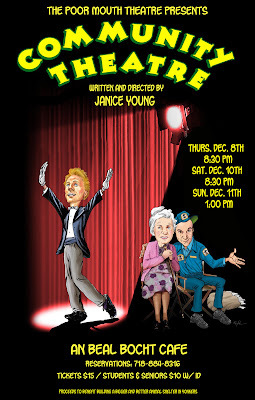 Written and Directed by Janice Young, this show featured Terence Patrick Dover, Marilyn Raider, Peter Mountford, Jordan Laks and Caitlin Seward. Partial proceeds went to benefit building a bigger and better animal shelter in Yonkers. 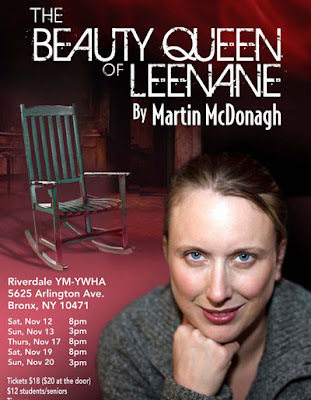 In association with Riverdale Repertory Company, Poor Mouth Theatre Company proudly presented THE BEAUTY QUEEN OF LEENANE, Martin McDonagh's masterwork of claustrophobia and entrapment at Riverdale YM-YWHA in November, 2011. Set in the Irish village of Leenane, Connemara, this play had it all - black comedy, melodrama, horror and bleak tragedy. 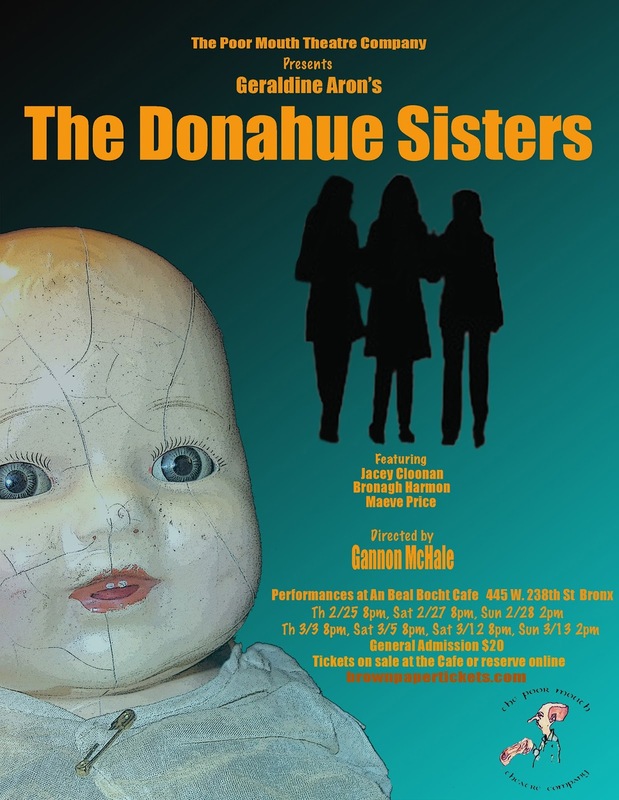 Directed by Don Creedon, with incredible performances by Bronagh Harmon, Katherine O'Sullivan, David O'Hara and Johnny Kealy, this production was an instant classic that will be talked about for years! Poor Mouth's presented a special performance of THE PARTING GLASS, presented on July 24, 2011. Straight from a national tour of Ireland, Dermot Bolger's highly acclaimed new play starred Abbey Theatre veteran Ray Yeats as a returning Irish expat who bears witness to his country's stunning reversal of fortune. 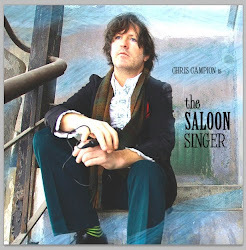 Poor Mouth presented THE SALOON SINGER, Chris Campions hilarious new music, storytelling, and multimedia driven show, on June 29 and 30, 2011. Chris Campion is the lead singer of the Knockout Drops and author of Escape from Belleview - A Rock 'n Roll Odyssey. MATINEE DAY - written and directed by Joan Lunoe, featuring Beth Roby and Joan Lunoe; FEAR OF ZOMBIES - written by Craig Jesson, directed by Scott Kennedy, featuring Lauren Drew, Mark Erickson, Caitlin Seward, and Raphael Rosenbaum; MAN ON BRIDGE WITH BOOK - written by Stan Peal, directed by Allison Martin, featuring Hugh Davies, Allison Martin, Kelsey Formost, and Camille Dewing; PROVERBS - written by Charlene Donaghy, directed by Paul Revaz, featuring Keith Paul, Jamal Ford-Bey and Jane Coughlin; SOCIAL BINDING - written and directed by Janice Young, featuring Steve Oates, Clare Donnelly, J.R. Burris and Janice Young. 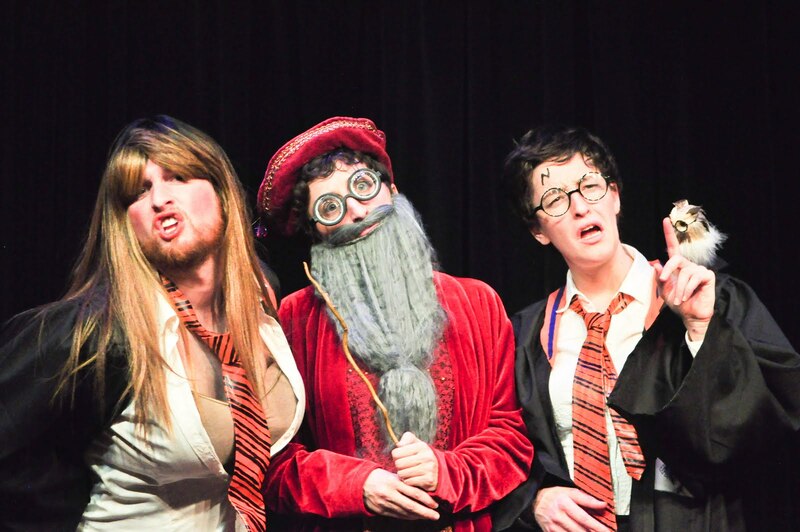 On Saturday, February 26, 2011, Poor Mouth produced it's first ever night of 24 HOUR THEATRE. 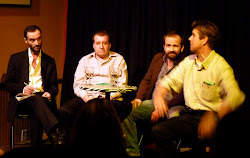 Six writers met on Friday, 25th February, 2011. Each was given a topic and a number of actors. 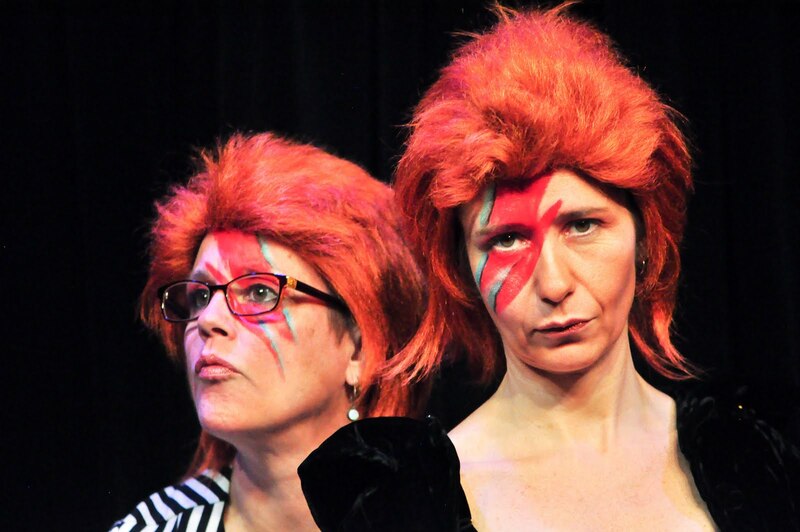 They had 24 hours to write, rehearse and produce a ten minute play and perform it at 8 pm on the following night, 26th February. 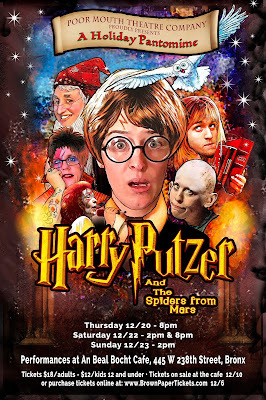 The result was a wonderful night of hilarity and theater never to be repeated (obviously!). Poor Mouth Theatre kicked off 2011 with a reprisal of SWANSONG written by Conor McDermottroe and performed by Tim Ruddy on January 20, 2011. 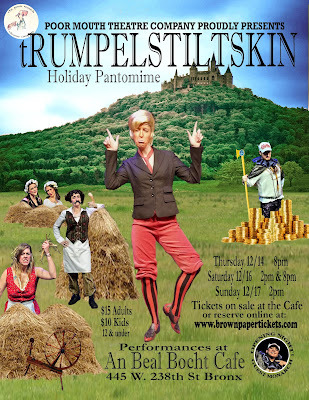 (for production details, see our September 2010 show below). 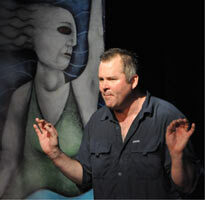 On December 1 and 2, 2010, Poor Mouth presented the critically acclaimed play THE SCAVENGER'S DAUGHTER written and performed by Irish-Canadian Colm Magner. "Brutal, poetic, darkly funny...and very Irish". EVERYTHING MUST GO - written by Jamie Budge Gehman and directed by Colin Broderick, featuring Jamie Budge Gehman, Gordon Tashijan, Chrissie Penna, and Nandanie Dudhnath; UNTITLED MONOLOGUE - written, directed and performed by Chris Campion; BILL'S ARC - written and directed by Scott Kennedy, performed by Steve Oates, Jonna McElrath, Beth Roby, Bronagh Harmon, Julian Gamble; CHRIST IS THE ANSWER...BUT WHAT IS THE QUESTION? 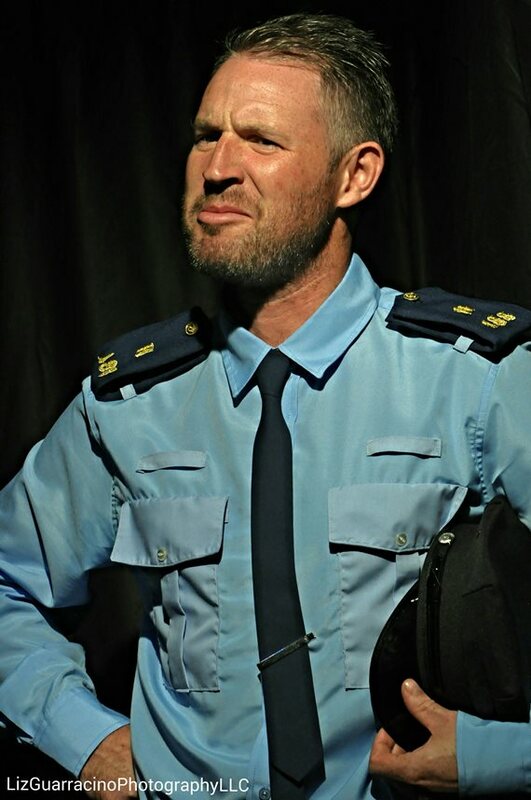 - written, directed and performed by Bill Rutkoski; THE BIG FIVE O, written by Janice Young, directed by Don Creedon, featuring Laurence Lowry, Ciaran Byrne, Andy Fitzpatrick, and Conor McManus. On September 16, 2010, Poor Mouth Theatre Company's presented a charity benefit performance of SWANSONG written by Conor McDermottroe and performed by Tim Ruddy. 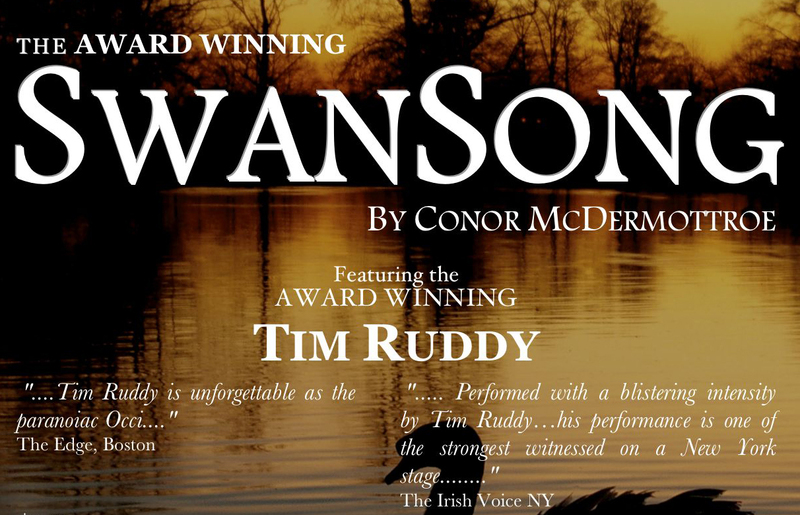 A bruising picture of life in the west of Ireland, SwanSong is the story of Austin 'Occi' Byrne, who brings us on the roller-coaster ride of his life. 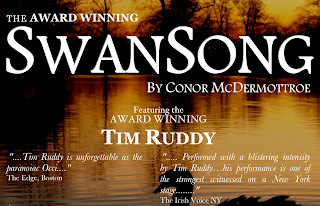 "...performed with a blistering intensity by Tim Ruddy, the play is a fast, furious ride through societal dysfunction in the west of Ireland. 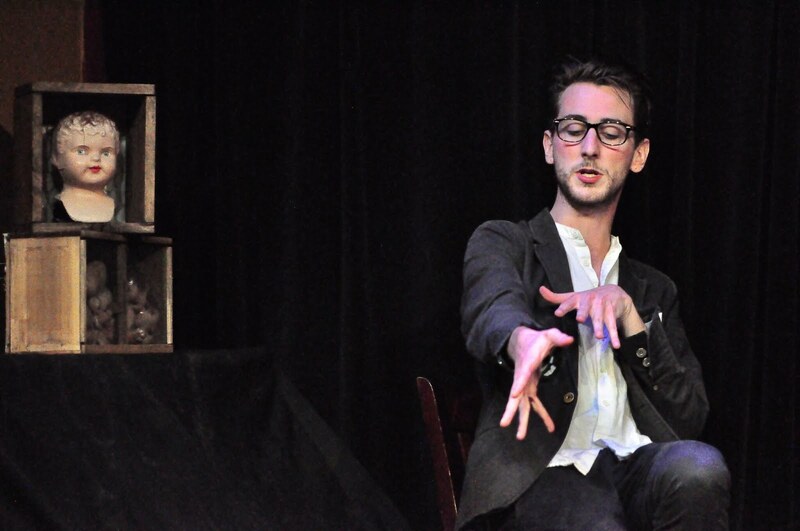 Skilled, focused and whip smart his performance is one of the strongest witnessed on a New York stage" - The Irish Voice. 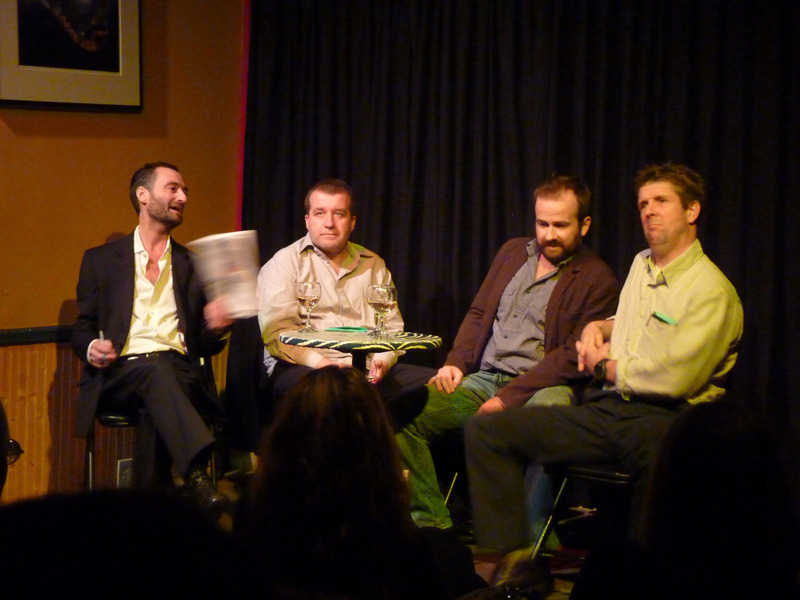 Poor Mouth Theatre Company received the Audience Award for Best Play at the 1st Irish 2010 Theatre Festival for its "site specific" production of GUY WALKS INTO A BAR at Ryan's Daughter Bar on New York's upper east side, running from September 22 to October 2, 2010. 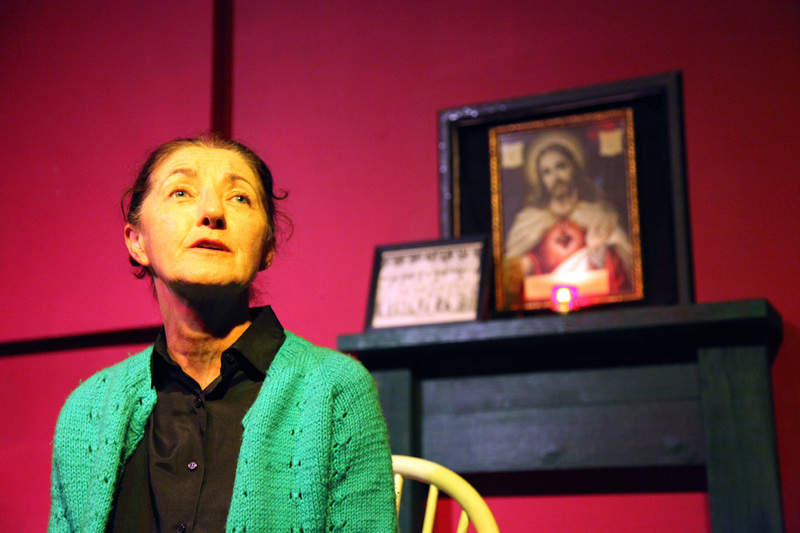 On September 8 and 9, 2010 Poor Mouth produced the US premiere of Dermot Bolger's THE HOLY GROUND directed by Don Creedon, performed by Katherine O'Sullivan. 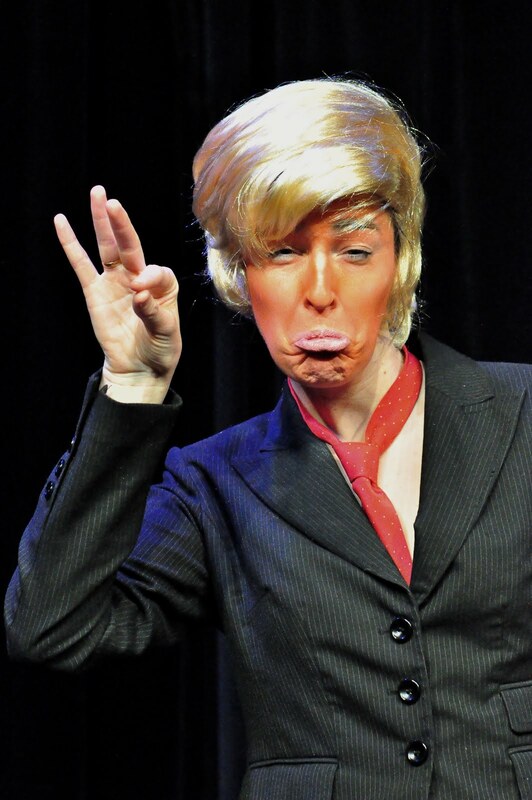 After decades of marriage to a man who grew increasingly cruel and distant, Monica now clears out her past and finally begins to stand up for herself. 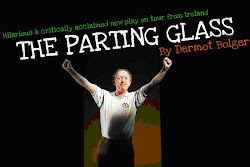 Written by award-winning Dublin playwright Dermot Bolger and performed by Katherine O’Sullivan, best actress nominee, 1st Irish Festival 2009. 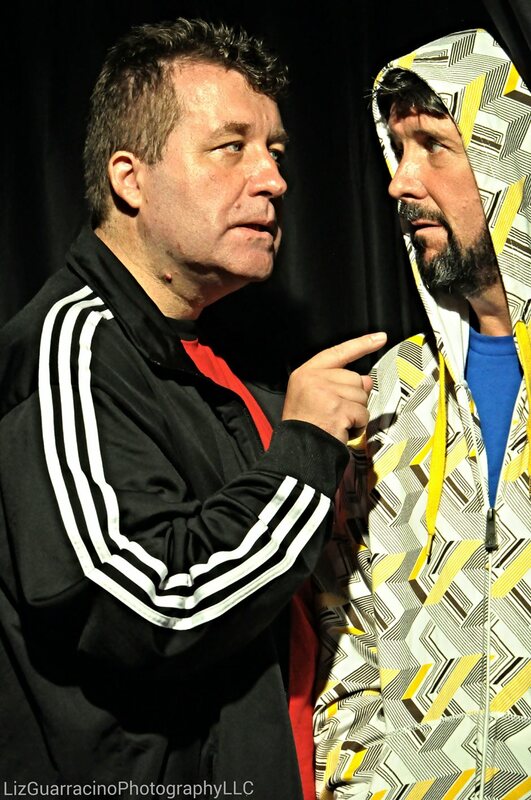 “A tour de force...stream of consciousness theatre at its best.” - The Sunday Press (Ireland). CELTIC TIGER WAKE - written and directed by Don Creedon, featuring John Redmond, Andy Fitzpatrick and Conor McManus; THE ACTRESS - written by Sara McDermott, directed by Tim Ruddy, featuring Nicola Murphy; SHACKLED - written and directed by Don Creedon, featuring Katherine O'Sullivan, Bronagh Harmon and Andy Fitzpatrick; TURNSTILES - written by Liz Amberly, directed by Carrie Isaacman, featuring Amanda Sayle and Liz Forst; THAT’S THAT - written by Colin Broderick, featuring Colin Broderick; PEARLY GATES, written by Stephen Smallhorne, directed by Don Creedon, featuring Stephen Smallhorne, Conor McManus and Tony Caffrey.